Note: I have published a paper that is very coherent and fully explains this so-called God-given number. There is nothing magical about it. It is just a scaling constant. Check it out: The Meaning of the Fine-Structure Constant. No ambiguity. No hocus-pocus. 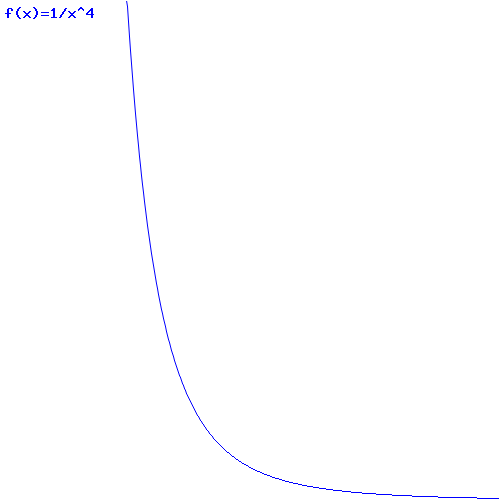 In fact, the need for a ‘cut-off factor’ so as to ensure our energy function doesn’t ‘blow up’ is not because of the exponent in the 1/r4 expression: the need is also there for any 1/r relation, as illustrated below. All 1/rn function have the same pivot point, as you can see from the simple illustration below. So, yes, we cannot go all the way to zero from there when integrating: we have to stop somewhere. We’re going to look at the simple structure of this relation, and all of its implications. The simple equation above says that the energy of our electron is (a) proportional to the square of its charge and (b) inversely proportional to its radius. Now, that is a very remarkable result. In fact, we’ve seen something like this before, and we were astonished. We saw it when we were discussing the wonderful properties of that magical number, the fine-structure constant, which we also denoted by α. However, because we used α already, I’ll denote the fine-structure constant as αe here, so you don’t get confused. You’ll remember that the fine-structure constant is a God-like number indeed: it links all of the fundamental properties of the electron, i.e. its charge, its radius, its distance to the nucleus (i.e. the Bohr radius), its velocity, its mass (and, hence, its energy), its de Broglie wavelength. Whatever: all these physical constants are all related through the fine-structure constant. This says that the mass of the electron is equal to the ratio of the fine-structure constant and the electron radius. [Note that we express everything in natural units here, so that’s Planck units. For the detail of the conversion, please see the relevant section on that in my one of my posts on this and other stuff.] In fact, the U = (3/5)·e2/a and me = αe/re relations looks exactly the same, because one of the other equations involving the fine-structure constant was: αe = eP2. So we’ve got the square of the charge here as well! Indeed, as I’ll explain in a moment, the difference between the two formulas is just a matter of units. Now, you can check for yourself: it’s just a matter of re-expressing everything in standard SI units, and relating eP2 to e2, and it should all work: you should get the Eelect = (2/3)·e2/a expression. So… Well… At least this takes some of the magic out the fine-structure constant. It’s still a wonderful thing, but so you see that the fundamental relationship between (a) the energy (and, hence, the mass), (b) the radius and (c) the charge of an electron is not something God-given. What’s God-given are Maxwell’s equations, and so the Ee = αe/re = eP2/re is just one of the many wonderful things that you can get out of them. Note that the elementary charge e is actually equal to qe/4πε0, which is what I am using in the formula. I know that’s confusing, but it what it is. As for the units, it’s a bit tedious to write it all out, but you’ll get there. Note that ε0 ≈ 8.8542×10−12 C2/(N·m2) so… Well… All the units do cancel out, and we get a dimensionless number indeed, which is what αe is. The point is: this expression links αe to the the de Broglie relation (p = h/λ), with λ the wavelength that’s associated with the electron. Of course, because of the Uncertainty Principle, we know we’re talking some wavelength range really, so we should write the de Broglie relation as Δp = h·Δ(1/λ). Now, that, in turn, allows us to try to work out the Bohr radius, which is the other ‘dimension’ we associate with an electron. Of course, now you’ll say: why would you do that. Why would you bring in the de Broglie relation here? If we assume that (a) an electron takes some space – which I’ll denote by r 🙂 – and (b) that it has some momentum p because of its mass m and its velocity v, then the ΔxΔp = ħ relation (i.e. the Uncertainty Principle in its roughest form) suggests that the order of magnitude of r and p should be related in the very same way. Hence, let’s just boldly write r ≈ ħ/p and see what we can do with that. We know that the kinetic energy of our electron equals mv2/2, which we can write as p2/2m so we get rid of the velocity factor.Well… Substituting our p ≈ ħ/r conjecture, we get K.E. = ħ2/2mr2. So that’s a formula for the kinetic energy. Next is potential. The formula for the potential energy is U = q1q2/4πε0r12. Now, we’re actually talking about the size of an atom here, so one charge is the proton (+e) and the other is the electron (–e), so the potential energy is U = P.E. = –e2/4πε0r, with r the ‘distance’ between the proton and the electron—so that’s the Bohr radius we’re looking for! Done. We’re right on the spot. The Bohr radius is, effectively, about 53 trillionths of a meter indeed! So we get that α/re = 1/αr and, therefore, we get re/r = α2, which explains why α is also equal to the so-called junction number, or the coupling constant, for an electron-photon coupling (see my post on the quantum-mechanical aspects of the photon-electron interaction). It gives a physical meaning to the probability (which, as you know, is the absolute square of the probability amplitude) in terms of the chance of a photon actually ‘hitting’ the electron as it goes through the atom. Indeed, the ratio of the Thomson scattering cross-section and the Bohr size of the atom should be of the same order as re/r, and so that’s α2. I should go through the motions here – I’ll probably do so in the coming days – but you can see we must be able to get it out somehow from all what we wrote above. See how powerful our Uelect ∼ e2/a relation really is? It links the electron, charge, its radius and its energy, and it’s all we need to all the rest out of it: its mass, its momentum, its speed and – through the Uncertainty Principle – the Bohr radius, which is the size of the atom. […] OK. OK. Let me tell you. It’s not that simple here. All those relationships involving α, in one form or the other, are very deep. They relate a lot of stuff to a lot of stuff, and we can appreciate that only when doing a dimensional analysis. A dimensional analysis of the Ee = αe/re = eP2/r yields [eP2/r] = C2/m on the right-hand side and [Ee] = J = N·m on the left-hand side. How can we reconcile both? The coulomb is an SI base unit , so we can’t ‘translate’ it into something with N and m. [To be fully correct, for some reason, the ampère (i.e. coulomb per second) was chosen as an SI base unit, but they’re interchangeable in regard to their place in the international system of units: they can’t be reduced.] So we’ve got a problem. Yes. That’s where we sort of ‘smuggled’ the 4πε0 factor in when doing our calculations above. 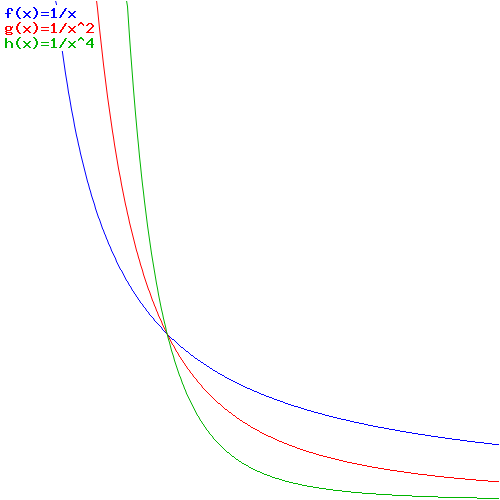 That ε0 constant is, obviously, not ‘as fundamental’ as c or α (just think of the c−2 = ε0μ0 relationship to understand what I mean here) but, still, it was necessary to make the dimensions come out alright: we need the reciprocal dimension of ε0, i.e. 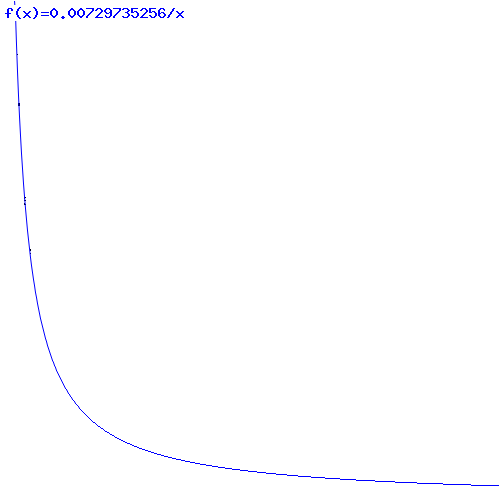 (N·m2)/C2, to make the dimensional analysis work. We get: (C2/m)·(N·m2)/C2 = N·m = J, i.e. joule, so that’s the unit in which we measure energy or – using the E = mc2 equivalence – mass, which is the aspect of energy emphasizing its inertia. God doesn’t want our equations to blow up. Our equations are all correct but, in reality, there’s a cut-off factor that ensures we don’t go to the limit with them. So the fine-structure constant anchors our world, so to speak. In other words: of all the worlds that are possible, we live in this one. So… What’s the conclusion? Nothing much. We’ve sort of concluded our description of the classical world… Well… Of its ‘electromagnetic sector’ at least. 🙂 That sector can be summarized in Maxwell’s equations, which describe an infinite world of possible worlds. However, God fixed three constants: h, c and α. So we live in a world that’s defined by this Trinity of fundamental physical constants. Why is it not two, or four?